Eschewing the deck today for some Featured Griptape, which you can also design at BoardPusher.com. 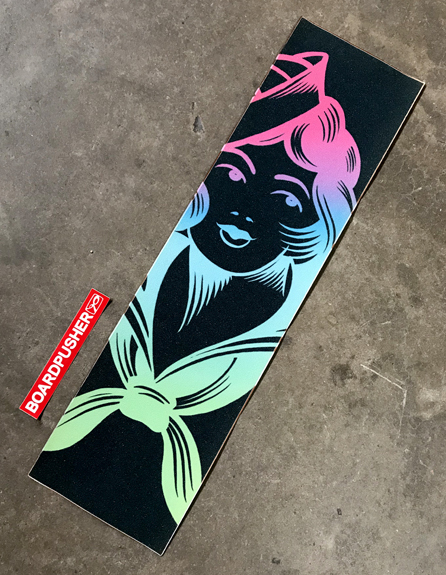 “Party Babe” was created by tattoo artist J. Brett Prince who obviously likes to bring that traditional style to his skateboarding graphics as well. Follow him on Instagram @mrjbrettprince or pick up one of his skateboard and/or griptape designs at BoardPusher.com/shop/bonezone. Create your own custom griptape to match your skateboard graphic at BoardPusher.com. 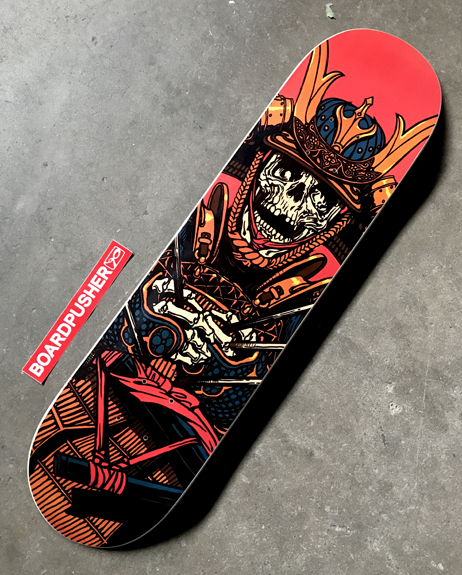 We’re impressed by the detail in this samurai who was bested by an archer(s) skateboard graphic created by the artist simply known as Carbine, so we made it today’s BoardPusher.com Featured Deck. Carbine’s work can be found all over the internet here, but he also has a shop with us and you can pick up one of his skateboard designs at BoardPusher.com/shop/digitalcarbine. Expand your personal brand by throwing skateboard graphics into the mix with your own shop at BoardPusher.com. 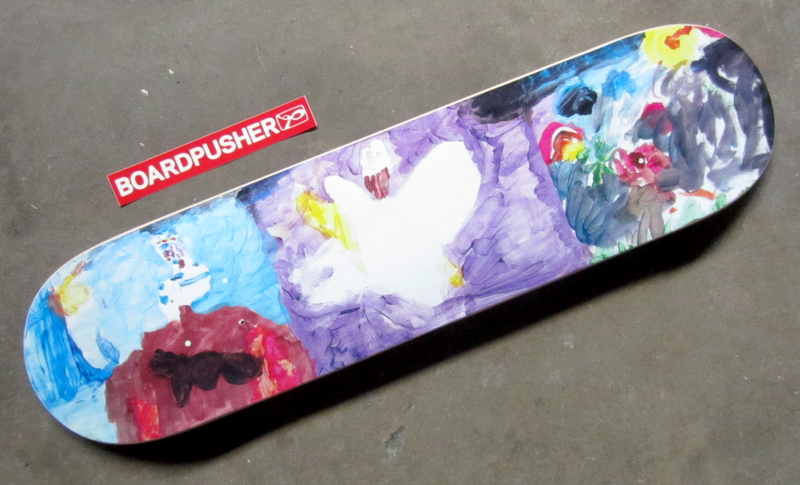 This BoardPusher.com Featured Deck was created by little grom Leon for his dad, Kevin. Leon’s mom, Alex, let us know that each panel represents something Leon and Kevin like to do together. “Left Panel: there is a little yellow kayaker going down a waterfall. Then there are two mountains – Stone Mtn here in Atlanta and Mt Everest with it’s flags behind it in the distance. Middle Panel: a skull and crossbones (’cause every board needs a good skull and crossbones). Right Panel: this is a camping scene with a bonfire and tent. According to Leon, ‘You can’t see most of it because it’s dark out’.” Alex and Kevin run the Frenchmill Studios design agency which you can check out here. Get ’em hooked on creativity while they’re young by designing skateboard graphics at BoardPusher.com. Click here to try our new Draw a Skateboard option, perfect for skateboarders and artists of all ages. Scrolling though Jeffrey Docherty’s Instagram (@jeffrey_docherty) you can tell he has a keen interest in classic race cars and does a phenomenal job of recreating his favorites. 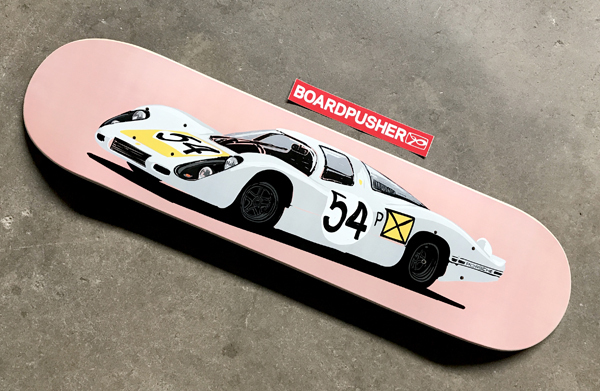 He chose to highlight this 1968 Porsche 907 Longtail as a skateboard graphic and it’s this week’s BoardPusher.com Featured Deck. You can browse Jeffrey’s other work at jeffreydocherty.com. Create a custom skateboard graphic out of whatever interests you at BoardPusher.com. We have chosen Roshi’s deck graphic as the BoardPusher.com Create Your Own Pro Model Skateboard Design Contest Winner. He designed this deck under his KTYD brand for his buddy, skateboarder Dale Hawkins. 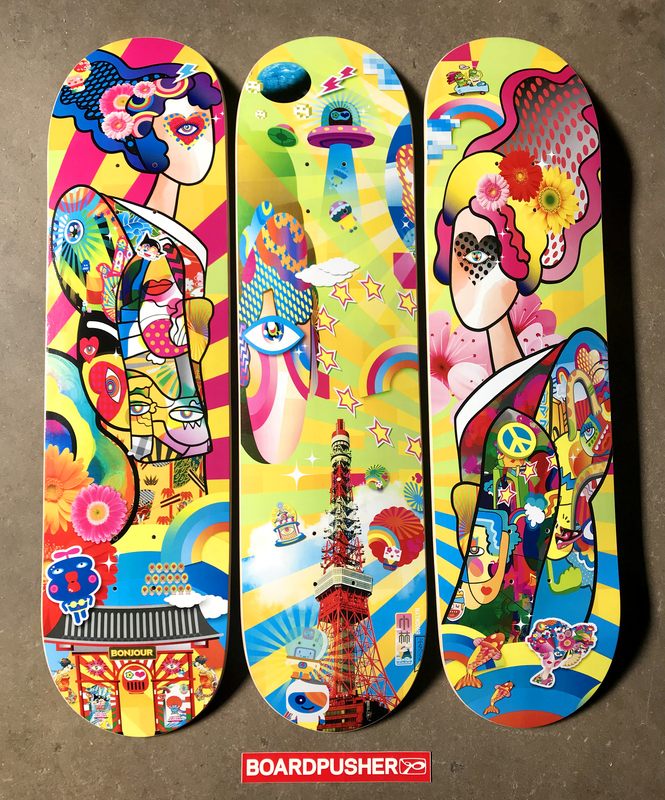 We are sending Roshi three decks with his winning graphic to do whatever he wants with them, though we suspect he might share one with Dale. Check out a video of Dale skating here and find more of Roshi’s artwork here or follow him on Instagram @dirtyoldroshi. We want to thank everyone who entered. It looks like you had a lot of fun creating your own pro model on BoardPusher.com and we certainly enjoyed looking through all of your submissions. It’s always a difficult task to choose just one. Keep an eye out for the next design contest coming soon. Here’s your chance to win your own custom designed pro model style skateboard graphic! 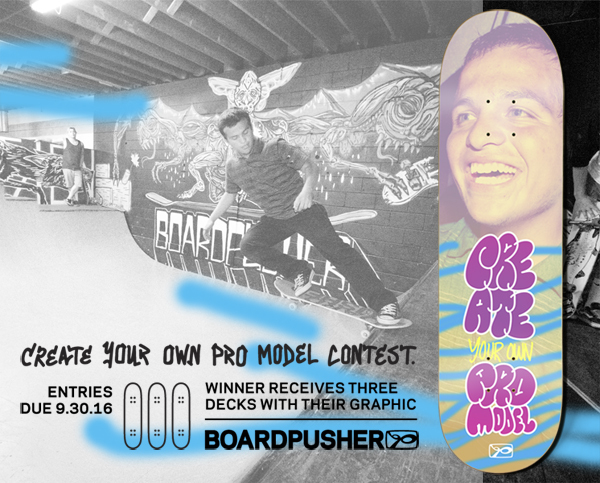 For September, BoardPusher.com will be accepting entries for our Create Your Own Pro Model Design Contest. The winner will receive his or her graphic on 3 decks, in case you want to skate a couple and hang one, or just thrash ’em all. You can create a graphic for yourself or a friend. We are not looking for you to design a graphic for a pro skateboarder nor a design that relates to another skateboard company. Such entries will be considered invalid. We look forward to seeing what you come up with and have fun! To enter or for more details, head on over to http://www.boardpusher.com/contest. Congratulations to Neil Smalley, the winner of the “Horizontal” THI3D THURSDAY Skateboard Design Contest. Neil will be receiving his winning graphic “Brace Yourself” as well as $100. You can check out his design company at http://www.groundworkcreative.co. 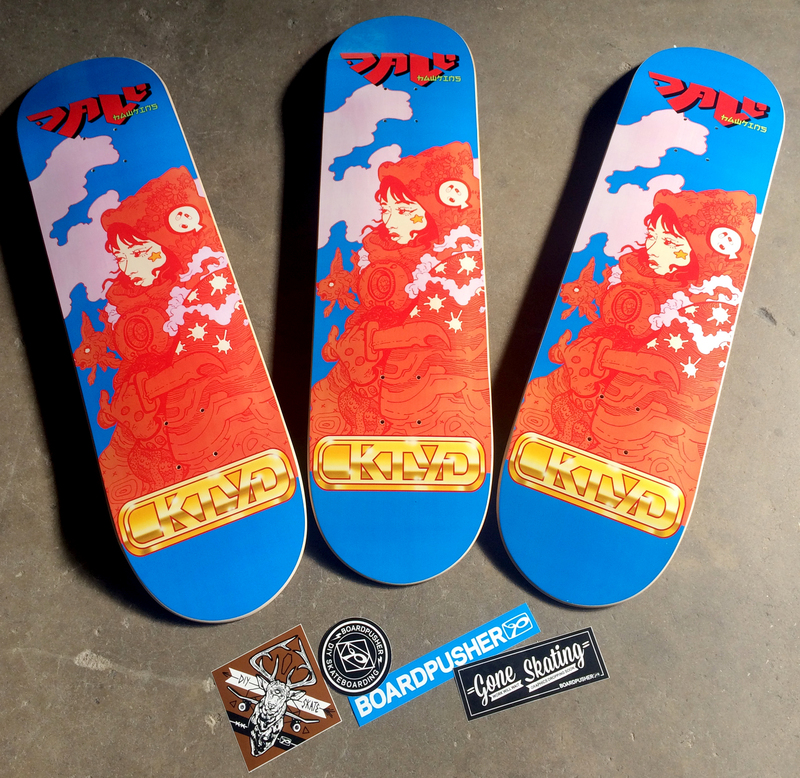 This deck is now available alongside all of the other THI3D THURSDAY winners at http://www.BoardPusher.com/THIRDTHURSDAY. Congratulations to Charles Ben Russell, the winner of the “Planes, Trains, & Automobiles” THI3D THURSDAY Skateboard Design Contest. Charles will be receiving his winning graphic “Redbird Rocket” as well as $100. See more of his artwork at http://www.charlesbenrussell.com. This deck is now available alongside all of the other THI3D THURSDAY winners at http://www.BoardPusher.com/THIRDTHURSDAY.